The Center for Advanced Radio Astronomy (CARA), a center of excellence of The University of Texas System, was created three years ago with the mission to create future leaders in space exploration and related technology development. Dr. Fredrick Jenet led the development of CARA and is currently the center's director. At the heart of CARA's programs, lies a fine balance between academics and research that leads students into successful careers in science. CARA has placed UTRGV among the top 10 producers of Hispanic physicists in the United States. In 2013, CARA was identified by The University of Texas System Chancellor as the first designated research unit of the new university that will establish a research culture with national and international prominence. Thus, any proposed centers of excellence at the new University of Texas Rio Grande Valley could follow CARA’s model and benefit from CARA’s experience. CARA is a leader in developing radio frequency based techniques for space exploration as well as for creating innovative programs to attract and train the next generation of scientists and engineers with a strong background in modern radio frequency technology. CARA strongly networks on behalf of UTRGV students, opening doors and creating new opportunities for further training in other institutions. CARA’s network of collaborating institutions includes NASA’s JPL, NASA Goddard, the US Naval Research Laboratory, the University of New Mexico, the Max Planck Institute for Radio Astronomy, and Peking University. CARA currently runs three integrated research/education programs: the Arecibo Remote Command Center (ARCC), the Low Frequency All Sky Monitor (LoFASM), and STARGATE. In addition, CARA's director is a founding member and current chair of the North American Nanohertz Observatory for Gravitational Waves (NANOGrav). These projects focus on student training and mentoring. Students are actively involved in high priority research efforts and contribute to scientific discoveries. The Arecibo Remote Command Center (ARCC) is a new model of education that uses radio astronomy to attract, train, and retain students into STEM fields. In 2006, ARCC brought the world’s largest and most sensitive radio telescope to South Texas - the National Astronomy and Ionosphere Center’s Arecibo radio telescope. The idea was to attract local students into serious research by enabling them to play a role in Arecibo-related science. The ARCC students control many of the world’s major radio telescopes in addition to Arecibo including the Robert C. Byrd Green Bank radio telescope, the Long Wavelength Array, and the Effelsberg Radio Telescope. For the first two years, all ARCC Scholars participate in radio pulsar surveys that involves going through massive amounts of data from throughout the galaxy gathered by the Arecibo and Green Bank radio telescopes. Students are responsible for the discovery of over 50 radio pulsars, including a double neutron star system, one of only 10 ever discovered. In their third year, they work on their own research project supervised by one of the department faculty professors; at the same time, they graduate to “Team Leader” positions and mentor junior students. By their fourth year, they continue as team leaders and submit a thesis of their research work to the department. Upon graduation the ARCC scholars pursue doctoral programs in physics, astronomy, or related STEM fields. The ARCC program was developed at the university’s Department of Physics and Astronomy and is one of the top ten programs in the nation to graduate Hispanic students with bachelor degrees in physics and underscores the profound effect research can have on the careers of students. The ARCC program is being replicated at other universities throughout the United States. 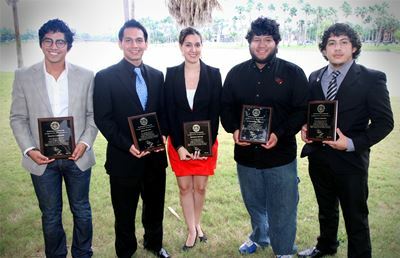 Frank Ceballos, Jesus Rivera, Rossina Miller, Alex Garcia and Louis Dartez were in the inaugural class of ARRC Scholars and earned bachelor’s degrees in physics in 2012. Funded by the U.S. Department of Defense, the Low Frequency All Sky Monitor (LoFASM) is a system of radio telescope arrays distributed throughout the United States. Currently, LoFASM has four stations on the ground located at Port Mansfield, TX, Socorro, NM, and Green Bank, WV, and NASA's Goldstone deep space communication complex. CARA students have been directly involved in the development of the LoFASM equipment, which is based on technology designed by CARA collaborators at the Naval Research Laboratory. The North American NanoHertz Observatory for Gravitational Waves (NANOGrav) is a consortium of 14 institutions in the U.S. and Canada that is developing the technique of using radio pulsars to detect and study gravitational waves. CARA plays a leading role in this collaboration. The efforts of NANOGrav were deemed a high priority by the national research council. ARCC students are contributing to the science goals of the collaboration through their pulsar searching efforts. ARCC students train with collaborators within NANOGrav and its international partners in Australia, Germany, and China.